We’d love your help. Let us know what’s wrong with this preview of Panda Bear, Panda Bear, What Do You See? by Bill Martin Jr.. Preview — Panda Bear, Panda Bear, What Do You See? by Bill Martin Jr.
Thirty-five years after their first groundbreaking collaboration, the creators of Brown Bear, Brown Bear, What Do You See? and Polar Bear, Polar Bear, What Do You Hear? reunite to address the important topic of ani The author and illustrator team behind the classic Brown Bear, Brown Bear, What do you see? turn their extraordinary talents ot the theme of animal conservation. To ask other readers questions about Panda Bear, Panda Bear, What Do You See?, please sign up. This book comes with endargered animals ? Eric Carle cheapens what once was the great Bear franchise with this egregious piece of dung. After the lyrical, almost mystical revelation that was "Brown Bear, Brown Bear," let's hope this woeful follow-up is relegated to the ashheep of history and Carle is put to death for his heinous crime. Panda Bear, Panda Bear, you know what I see? I see a grotesque exploitation of little children and a soulless money-making machine that needs to be dismantled by anyone who cares about children's literatu Eric Carle cheapens what once was the great Bear franchise with this egregious piece of dung. After the lyrical, almost mystical revelation that was "Brown Bear, Brown Bear," let's hope this woeful follow-up is relegated to the ashheep of history and Carle is put to death for his heinous crime. Panda Bear, Panda Bear, you know what I see? I see a grotesque exploitation of little children and a soulless money-making machine that needs to be dismantled by anyone who cares about children's literature in the United States. Thanks for making me believe in the magic of make-believe and then dousing me in the cold water of commercial reality. I will be leading a rally against "Panda Bear, Panda Bear" and the Von Holtzbrinck Publishing Group, location as yet to be determined, on Christmas Day this year, or sometime thereafter. Please email me for more info. Together, we can make a difference. Thank you. There are lots of wiggle and stretch opportunities for children in this book, so in our story time we all stood up as we opened to the first page. Panda sees a bald eagle (everyone flap wings, being careful not to bump any friends). Eagle sees a water buffalo (everyone run in place, as if "charging"). Buffalo sees a spider monkey (everyone wave arms as if "swinging"). Monkey sees a green sea turtle (everyone paddle flippers). Turtle sees a macaroni penguin (everyone strut in place--Charlie Chaplin st There are lots of wiggle and stretch opportunities for children in this book, so in our story time we all stood up as we opened to the first page. Turtle sees a macaroni penguin (everyone strut in place--Charlie Chaplin style). Sea lion sees a red wolf (everyone tiptoe in place as if sneaking). Wolf sees a whooping crane (everyone stand on one leg). Crane sees a black panther (everyone sit back down). I wish I could say I liked this book, but I rarely read it to my daughters because it is so complicated. It does not flow well at all compared to Brown Bear, Brown Bear. The names of the animals are very complicated so I think it is hard for my language-challenged daughters to follow. Also, the end is kind of preachy. This is Gus's favorite book in the world. I've grown to truly hate it. Basic Plot: Animals in the wild. 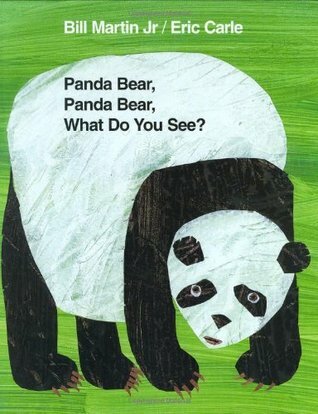 This book was identical in structure to Polar Bear, Polar Bear, What Do You Hear?, also by Bill Martin Jr. and Eric Carle. Carle's colorful, distinct artwork accompanies a simple, repetitive question-response format that my little guy really loves. The only trick was getting him to say "see" instead of "hear" like he did in the other book. As before also, I wasn't terribly into it, but he was, and that's the important thing with these stories. To see him get invol Basic Plot: Animals in the wild. While I don't think this book is as good as its predecessor I still think this book would be loved by children. It's use of repetition will have kids reading along and acting out the animals from the pages. The illustrations are quite beautiful and done in a style that children will find appealing. In the classroom this would be great for early learners. I'd use this in a read aloud for kindergarteners or first graders. The use of animals will engage the students and could be a perfect opportuni While I don't think this book is as good as its predecessor I still think this book would be loved by children. It's use of repetition will have kids reading along and acting out the animals from the pages. The illustrations are quite beautiful and done in a style that children will find appealing. This book is similar to Brown Bear, Brown Bear, What Do You See?, but a copy is never as good as the original. The writing doesn't roll off the tongue, but it's nice to see that some obscure/specific (for kids) animals are mentioned. For example: macaroni penguin (as opposed to just penguin) and whooping crane. My husband HATES this book and refuses to read it to our daughter. She seems to be okay with hearing it, though. I don't care one way or another. This book is very much like "Brown Brown Bear What Do You See?". I liked the repetition which is easy for children to follow. I also liked the introduction of animals that are not very common. The only thing I didn't enjoy was the story line because it is very close to the original. The illustrations were awesome too. Children usually like Eric Carle's creations, so I'll recommend one be in each classroom of young children as well as home. We've been reading this book every single night for the past year. It's the first book that my daughter has memorized enough to read to us! It has helped tremendously with learning about animals that have longer names. Instead of just monkey, she now knows that there are different types of monkeys. We love explaining the different habitats of each animal. This book has been lots of fun to read together and has helped us learn our colors and learn about new animals. My 18 month old likes this book even though I feel like it is Eric Carle selling out. Of course, endangered species are a great clause. But the original Brown Bear had such a rhythmical feel to it and this is tough. "Macaroni Pengiun, Macaroni Penguin What Do You Hear?" .... I mean, come on. My five year old son and I picked this book out as we had read a lot of Eric Carle books for his schoolwork. While I enjoyed the fact that this reads like Brown Bear, Brown Bear (making it easy for my three year old to 'read'), I did not really like the inclusion of some odd animal choices - like a black panther. There is no such thing as a panther. It would be a leopard. Panthera is the genus for the big cat family of leopards, lions, tigers, and jaguars. (And yes, I know this is a children's b My five year old son and I picked this book out as we had read a lot of Eric Carle books for his schoolwork. Eric Carle and Bill Martin Jr. are the perfect pair. This is the third book written in the what do you see model and is just as good as the others. 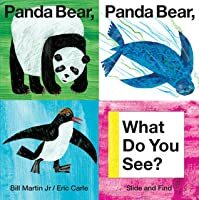 A panda spies a bald eagle who spies a water buffalo who spies a spider monkey who spies another animal all the way to a sleeping child dreaming about these animals all wild and free. This is a good book for introducing rhyme to children. It is also a good book to introduce the issue of endangered animals as each animal in the book is on the endangered Eric Carle and Bill Martin Jr. are the perfect pair. This is the third book written in the what do you see model and is just as good as the others. A panda spies a bald eagle who spies a water buffalo who spies a spider monkey who spies another animal all the way to a sleeping child dreaming about these animals all wild and free. It is also a good book to introduce the issue of endangered animals as each animal in the book is on the endangered list. A succession of animals, ending with a dreaming child, are asked what they see. This book introduces young readers to the concept of endangered species and features animals that are endangered. 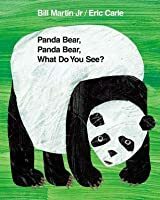 The rhyming repetitive text allows small children to anticipate what will happen next and participate in the story, and the illustrations are Eric Carle in his classic collage style. In much the same fashion that Brown Bear, Brown Bear, What Do You See includes animals, this one also includes fun animals. This book does an amazing job of using verbs that also describe how the wild animals move. While the sister book uses different colors to describe the animals, these wild animals included in this book are fairly true to nature. I liked this book both for it's repetition and illustrations. Bill Martin Jr and Eric Carle make a great team for young readers. This is an okay book it has the same simple story line of all the other what do you see? books. The artistic style that Bill Martin Jr. is so unique that I can tell just by the cover it is his book. I think that when it comes to books like this they are best read to a class while having them do motions for the animals. I recommend this book. This was a fun read! This would be fun for younger grade levels. The book uses repetition and rhyming so even if kids do not know how to read, they could still participate. It is also a good tool for teaching the students about animals and what they look like. This is a wonderfully written and illustrated simple rhyming storybook. Each page asks the animal 'what do you see' and they see the next animal in the story. Any age child can enjoy the text and illustrations of this story. Better use of verbs than Brown Bear, Brown Bear, What Do You See?. Other than Eric Carle's beautiful illustrations, I see nothing of note here. The animals are difficult ones for a child to differentiate from another of their genus. There's also no color learning in this one. I LOVE this. This is the same idea as "Brown Bear, Brown Bear, What do you see? ", but it's all endangered species. I love the art, the descriptors for each animal, and then the sleeping child at the end. I don't know - something about this book makes me feel good inside. Olivia liked that there was some animals that she had seen at the zoo. A good children book with different animals than the usuals. My kid loved the macaroni penguin. This is a poor follow up to Brown Bear. It's just doesn't flow like children's books tend to. There are other books of his I would rather read first over this one. Bill Martin, Jr. (1916-2004) was an elementary-school principal, teacher, writer, and poet. His more than 300 books, among them the bestselling classics Brown Bear Brown Bear What Do You See; Polar Bear Polar Bear What Do You Hear; Panda Bear Panda Bear What Do You See; and Chicka Chicka Boom Boom, are a testament to his ability to speak directly to children. Martin held a doctoral degree in early Bill Martin, Jr. (1916-2004) was an elementary-school principal, teacher, writer, and poet. His more than 300 books, among them the bestselling classics Brown Bear Brown Bear What Do You See; Polar Bear Polar Bear What Do You Hear; Panda Bear Panda Bear What Do You See; and Chicka Chicka Boom Boom, are a testament to his ability to speak directly to children. Martin held a doctoral degree in early childhood education. Born in Kansas, he worked as an elementary-school principal in Chicago before moving to New York City, where he worked in publishing, developing innovative reading programs for schools. After several years, he devoted himself full-time to writing his children's books. He lived in New York until 1993, when he moved to Texas. He lived in the east Texas woods, near the town of Commerce, until he passed away in 2004.